Family reunions are a special thing. These are folks who have known you, or at least heard about you, for your entire life. Before the Internet, before Facebook, people kept in touch with telephones and letters and photographs, and it was a rare thing to get everyone in one place at the same time. I still remember those reunions, all the people who looked just enough like family to be familiar, but I didn’t know well enough to be comfortable with. Awkward affairs, but important. Writing this has been much harder than it should be. I’ve taken so long on it that we took a holiday break between everyone else finishing theirs and me starting on mine. It’s a combination of factors, but I keep focusing on “gesundhoof” in Gerf’s first paragraph. My family says “gesundheit” when someone sneezes, and that started in my grandparents’ house. No idea where they got it, but I learned it from them. My grandmother died a couple months ago, and it’s been rough. We still don’t know who’s going to host Thanksgiving or Christmas next year, let alone extended family events. I hope that you can understand why writing about passing responsibility for a family tradition down from a grandparent would be difficult. Still important. 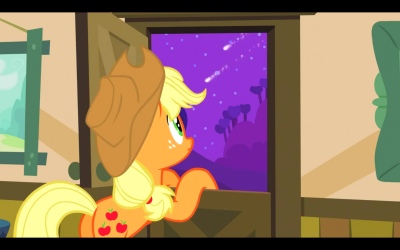 Anyway, here’s a picture of the most adorable Applejack that ever there was. Granny Smith throws the big Apple Family Reunion every eight years or so, and she’s lost just a little bit of gumption since the last one. Delightful responsible Applejack steps up and volunteers to run the event, and based on Granny Smith’s recounting of reunions past, plans out a series of that should keep everyone fully occupied for the entire duration of the gathering. She gets so focused on the things that ponies should be doing that she doesn’t account for the time they need to spend just socializing. Sure, events are important, but no one ever remembers who wins the race; they remember the time people got tangled up and fell in the mud, or the time someone got so caught up telling a story that they sewed half a dozen patches onto the quilt upside down, or the time one of the teenagers literally ate five steaks. Applejack’s schedule doesn’t permit any of that. The fruit bat rainbow was a really pretty idea that unfortunately didn’t go well, but the demolition of the Apple family barn did provide the transition she needed to focus on the fun. I’m happy to see Babs again so soon. Still not sold on her accent, but I like seeing her happy and bubbly and excited to be with Apple Bloom. I caught a Wilhelm Scream when Apple Bloom got so dizzy that she fell over. Still haven’t caught a Goathelm in any media, but by golly I’m looking forward to the day that I do. I’m a little surprised that Princess Celestia didn’t get a bunch of cauldrons and logs via Spike-a-gram. Wouldn’t have made much sense, but it could have been a fun gag. I wonder what Great-Aunt Applesauce’s name was before the incident with the dentures. I love the interactions between Applejack and Apple Bloom. They put a lot of meaning into looks and gestures and little loving actions. It’s a well-developed relationship, it shows instead of telling, and it’s great. At the very end, in Applejack’s letter to Princess Celestia, she says that you remember who you did something with long after you forget what you did. That is such an important lesson, not just for big things like hundred-pony reunions, but just for daily life. All factors considered, we should be back on schedule this week. I‘m not going to mince words here: I love all the horse puns in this show. When Granny Smith sneezes and AJ reflexively responds with “Gesundhoof”? The puns just don’t stop, nor should they. If I wind up being the last poor soul on this planet that appreciates these things, I sure as hay would be fine with that. 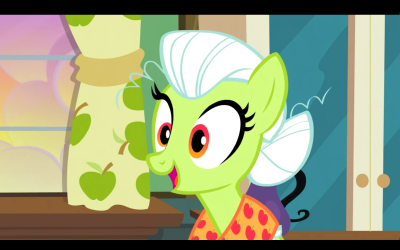 Tabitha St. Germain absolutely kills it with Granny Smith this episode. When she’s not making Rarity sound fabulous and Princess Luna sound mysterious, she is making Granny Smith sound like the coolest grandma ever. Her little stories while going through the Apple family photo album are the best. My favorite is when she’s describing Auntie Applesauce: that little “yeah” she tosses in there before saying they never found Auntie Applesauce’s teeth really jumps out as an excellent bit of voice acting to me for some reason. I don’t know if it was in the actual script or not, but in either case Tabitha made it sound so natural in that “not really thinking about this sound coming out of my mouth right now” kind of way. Back in the day, one of the hosts of the Bronyville podcast had some very good suggestions for what could make a pretty solid AJ-centric episode. Paraphrased and embellished a bit: there’s something massive that needs doing, and AJ asserts that she can take care of the situation with the help of her family. For one reason or another the other ponies don’t let her bring her family in and instead try fixing the problem on their own, but none of that is quite enough. AJ is insistent that if they would give her and her family a chance they’d take care of the problem lickety-split, but it’s only after the other ponies collapse in exhaustion that she is given permission to bring in her family. And when she does, they get the job done much faster and with more song and fun than anypony else’s strategies even come close to doing. Such a story would play to AJ’s strengths: family ties, honesty (“Honest, I can fix this problem, y’all just gotta give me a chance!”), and generally being a freakin’ horse force of nature. Instead, we get a weird inverted version of it: AJ’s Ponyville friends help her prepare for the Apple Family Reunion, but she ends up ruining it by being a stupendously silly pony once again. It seems all the AJ-centric episodes we’ve gotten thus far are the same way: they look appealing on the outside and you bite in with anticipation, but ultimately you’re underwhelmed (“that apple looked like it could have been so delicious!”). The sad part about this is now whenever we get a new apple, all those previous tasteless and mealy apples are going to put a bad taste in our mouths before we even take the first bite. Bah, enough with the metaphors. Quit writing Applejack as such a putz. She doesn’t run what is possibly one of Ponyville’s largest businesses by being clueless and shortsighted. So, yeah, fun episode, but another disappointingly mushy apple. Maybe the next one will be crisp and sweet. For this episode’s song, I’m going to recommend MLP – アップルジャック (Applejack) Remix by oodorato2. (There’s a video for it as well, but it includes a few Season 4 clips that, while not spoilery, are just too far ahead to recommend if you’re trying to read this blog sequentially.) I absolutely love songs that feature — or are composed entirely of — spliced pony vocals, and oodorato2’s take on the genre stands out as extremely unique and enjoyable. If you like this kind of stuff as well, I’d also recommend ポニーリミックス (Pony Remix), which makes the most imaginative and slick use of Raise This Barn in a remix that I’ve heard to date. It’s just for a second and it’s at the very very end, but what a tasty apple it is. I remember not being overly fond of this episode the first time I watched it, and warming up to it on subsequent viewings. This most recent viewing reminded me of what bugged me about it the first time through. Some of those things aren’t particularly large problems and feel more like nitpicks in hindsight (I recall complaining that not a single Mane 6 character other than AJ is remotely relevant in this episode, but really, there’s no real reason for any of them to be), but the core of it still kind of does feel like a bit of a problem – namely, Applejack feels like the wrong choice for this story. This episode relies on Applejack to be hanging on to the idiot ball for a rather hefty portion of it in order to make the conflict in it work, and it just… kind of feels out of character for her. Yes, her family is kind of omni-important to her, and the stress of putting the reunion together and doing it justice makes sense, but for her to react by over-complicating and over-planning things doesn’t seem like something she’d do. Applejack’s approach to problem solving is usually much more straightforward and direct, to the point that she’s become frustrated or critical of her friends when she thinks they’re making things more complex than they need to be in the past. This feels much more like a Twilight problem (or even a Pinkie or a Rarity one) than it does an Applejack one. 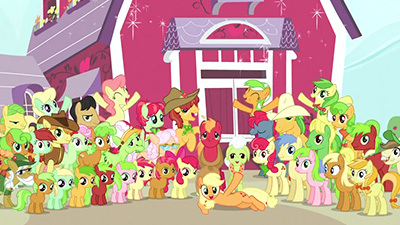 In fact, if you had almost any of the other main cast characters in AJ’s spot, Applejack would fit perfectly as the one arguing against the very things causing the problem in this episode in the first place. That said, there’s a lot about this episode that I like. I adore the Apple Family as a whole, and pretty much everything regarding them in this episode is great. It’s fun getting to see some old faces back (yay, more Babs! ), and getting to meet new members of the extended Apple clan is always fun. I do kind of wish we got to know more of them a bit better, and as awesome as it was to see Braeburn again, it was a bit of a bummer that he doesn’t even get a speaking line in this. I also really like the design of the fruit bats (although they single-handedly torpedo the premise of an upcoming episode next season). And then there’s the song. Racist Barn Raise This Barn is the first Applejack song we’ve gotten, and I really like it. The song is catchy, and it’s more of the Apple Family on display, which is the best part of this episode anyways. Finally, we have this. This episode was the closest thing we felt we were going to get at the time to a definitive answer on what exactly the status of Applejack’s parents was. 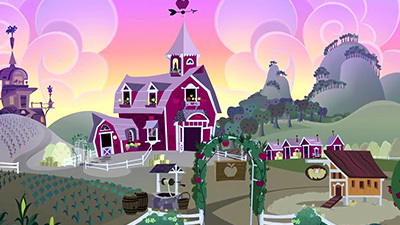 While there’s nothing concrete saying anything in this episode, the fact that it’s stressed that the entirety of the Apple clan will be attending the reunion kind of makes the absence of any other direct family members for the Ponyville Apples kind of stand out a bit to those looking. Add to that the pair of shooting stars that bookend the episode (which one of the artists has said directly were meant to represent the absent parents), and it feels pretty clear what the implication is. It’s a subtle nod towards it, but it was the closest thing to a confirmation at the time to something everyone already took as fact, and still remains one of the best bits of evidence for it. This is another one of those episodes which kept throwing off my expectations. When Granny pulled out the album and we started going into the photos, showing events from reunions past, I figured that would be an ongoing part of the story, contrasting past and future events. We get a bit of this, as we do indeed meet characters like Applesauce and see how the stages of her losing her teeth have carried onto continuing denture gags. But that’s really a small part of the episode as very few additional stories are told and characters fleshed out in such a fashion. When Applejack volunteered to take on the duties of arranging the reunion, I figured we’d be getting another typical Applejack story of her taking everything on herself, and ignoring offers of help from her friends until exhaustion kicks in. During that frazzled night where she stays up late to work on it after tucking Applebloom into bed, that’s EXACTLY where I thought we were going. But then! We get an entire montage of her going around to her friends who help her with supplies and info and Spike being used as a lighter in a way that looks kinda painful. So okay, I figure she’ll have the Mane Others involved all the way through. But no! We never see any of them again. Ever. She goes to them for help, then takes it all on herself. What Applejack are we getting! And then the relatives show up and the reunion starts… and everything looks fine. Looks great, even! Applejack has everything thought out and organized, her intro holler is excited and entertaining. She’s got this in the bag. And then the wrong starts creeping in. I love this, that the episode is playing on expectations, only to break them. The photos bit was probably just me latching onto what was always meant to be a brief visual device, but the stuff about Applejack always taking things on herself? We’ve seen that story so often by now that any time a situation like this pops up, that’s exactly where we’re going to expect it to go. Instead, things have evolved. She’ll go to her friends, she’ll be able to manage through things and sort them out. But that hyper-focus and anxiety is still there, and while her response has evolved, so too has the focus of her anxiety. It’s still about control and being able to live up to the pressure of everyone’s expectations, but instead of her taking everything on herself, it’s about micromanaging everyone else. They’re now included, but they have to follow these complex and taxing formulas she’s worked out for what needs to be done to achieve fun, while still keeping everything moving along at a constant pace, and also outdoing how it’s been done in the past. It’s impressive stuff, but understandably daunting on all those relatives who now find themselves pulled into it as she’s missed the one essential element of a reunion: hanging out and catching up. She’s so worried about everyone having something fun to do that she piles on so many things that they ultimately don’t have any fun. I love how most of this is related to us through Applebloom and Babs. All these kids want to do is chat about their friends, the CMCs, and what they’ve been up to lately, but that’s hard to do when a fun little race now extends for miles and includes so many obstacles that you’re left a panting, sweaty, dizzily exhausted mess by the end. 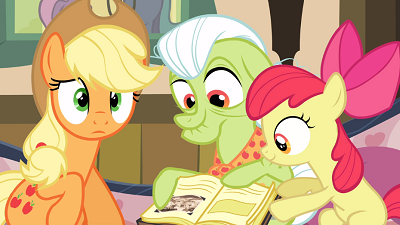 And Granny, Applesauce, and Rose just want to gossip as they poke at the quilt they’ve aimlessly toiled at for decades, but Applejack now seats them at sewing machines so loud they can’t hear each other over them, with the order to finally finish the dang thing. Even the fritter making has been turned into an over-achieving assembly line. I figured it was going to come to a head and someone would confront Applejack over it, but I never thought the tipping point to come when she leads to the destruction (yet again) of her own barn. That this leads to the entire family finally bonding over a loose and carefree barn raising is absolutely perfect. The poorly written song they sing while doing so, less perfect. Still, I like the twist, and that we return to the photo album for the addition of some new memories. I like this episode. It’s not one of the best this season, but it’s exactly what it should be, showing us a whole bunch of faces from this extended clan that we probably won’t see again for quite some time, if ever, just like any reunion. And it’s a nice continuation of Applejack’s continuing struggles to deal with the anxieties of responsibilities and the daunting legacy she always feels she has to live up to. Especially given the two figures absent from the reunion, who’s unspoken void leaves quite an open hole she works doubly hard to fill.